Pose snapshots  You can save the current pose of your skeleton and play it back in whole, part, mirrored, randomized and also in a different coordinate system. Poses you create can be played back on to any Automatron Bot. These Poses can also be played back in the Procedural Walking System as part of a walk cycle. 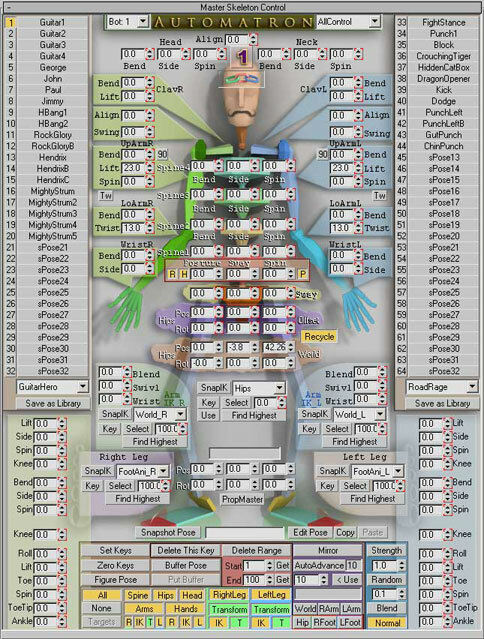 The longer you use Automatron, the larger your library of poses will become for all of your projects. There are two 32 slot banks for snapshot to be saved for each character. The Hand Panel also has a similar Pose Snapshot system.